Check to see if the windows open and close easily and lock securely. If you have trouble opening or closing your windows, this is a good indicator that the inner mechanisms are wearing out and it's time to replace the window. Windows should have at least two panes of glass—any window that is single paned is not energy efficient. Avoid windows made from wood. Vinyl windows are well insulated and airtight, but wood windows are not as energy efficient. Windows have energy ratings like any major home appliance. When purchasing windows look for models that are at least energy-star rated. Most windows have a layer of argon gas between the panes, which keeps the window airtight. After about 14 years, this insulating gas usually begins to leak out of the window. A good way to check if this is happening is to watch for water vapor condensing between the panels of a window. If you notice this, it means that the window's seal is broken and the gas has leaked out, allowing water vapor to come in and take its place. 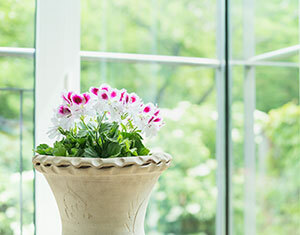 Checking your windows is an often-overlooked aspect of home maintenance. Windows are an important system in the home and should be maintained and replaced like any other major appliance.